Jesse and I have been together for almost five years - but until last year, we had never spent Christmas together. Whilst Jesse and I had been hoping for a long time that we would be together for Christmas last year - we stayed hoping for quite some time and hadn't actually been able to plan anything. One morning, I woke up and I had a message from Jesse that he had gotten the all clear and would be coming for Christmas. This was just one month before Christmas and I was so excited/overwhelmed/happy that I - first of all, cried (yeah, I'm that girl) - and then jumped out of bed and went running up the stairs, busting through the bathroom door where my mum was doing her hair and said (whilst practically hyperventilating) "JESSE'S COMING FOR CHRISTMAS!!!>#$(@#)(!!!!" all I got was a "What? What did you say?" and when I started crying I think she got confused even moreso. You see, we hadn't seen each other in 2 and 1/2 years. Also known as - forever. We hadn't parted emotionally whatsoever, but we'd been physically apart for way way waaay too long. So when, a few days later, I was perusing what was on offer at the Disney Store and I came across this bauble - I had to have it. So I ordered it. 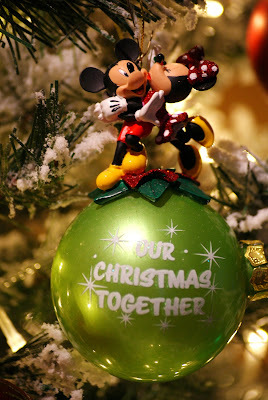 I am a huge Disney fan and so are my family, so we have dozens of Disney ornaments - from Pluto to Tinkerbell and everything in between. The ornament arrived just before Jesse came so I wrapped it up prettily and set it aside to give to him. You see, what made it extra special was that Jesse had never put up a Christmas tree - or decorated one. His family were never really into Christmas so he never got a chance - and as the queen of Christmas, I was preparing to give him the ultimate Christmas - gingerbread houses, tree decorating, Christmas light looking, Christmas carols, homemade shortbread and just about everything inbetween. So tell me, what's your favourite Christmas tree ornament?